MASS GOERS WILL be asked to contribute to another national collection at churches across the country to help cover the €4 million deficit from the World Meeting of Families. The total cost of the World Meeting of Families in August was €19.4 million. In a letter sent to parishes in the Elphin Diocese, seen by TheJournal.ie, Bishop Kevin Doran said the visit by Pope Francis had come in “significantly under budget thanks to good financial management”. “Unfortunately, in spite of a very successful effort, there was also a shortfall in fundraising income, due in no small measure to the consistent negative coverage in the media in the final weeks of the preparation,” he added. Some “fruit” died on the “trees”. The result is a deficit, which has to be covered by the Irish Church. A spokesperson for the Irish Catholic Bishops’ Conference outstanding deficit for the World Meeting of Families 2018 is “in the region of €4 million”. The bishop, in his correspondence, said he was writing to parishes to give advance notice that the Irish Catholics Bishops’ Conference had decided on an additional national collection on 10 and 11 November “to help defray the deficit”. He said this shortfall would otherwise fall to each diocese in proportion to its size. “I would ask you to support this collection to the best of your ability, as every penny that comes in will be a reduction in the amount that we will eventually have to pay from reserves,” he said. The bishop said this special collection, which is the fifth national collection for visit, will not replace the usual parish collection. 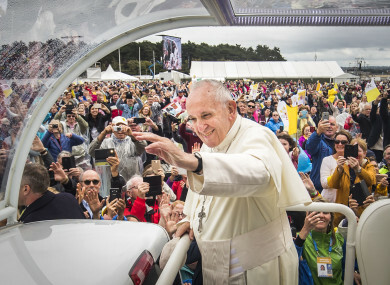 Around 130,000 people attended the Mass celebrated by Pope Francis in the Phoenix Park. Email “Priests told to have another national collection to help make up €4m deficit in fundraising for Pope visit ”. Feedback on “Priests told to have another national collection to help make up €4m deficit in fundraising for Pope visit ”.